With the aid of leading software and technologies Synergetic supplies and supports Computer Aided Engineering design solutions. With IGRIP and Robcad as primary tools we support projects from concept through design to installation, supplying various technical services such as feasibility studies, layout information and offline robot programming. Planning - Initial feasibility studies/conceptual design, simultaneous engineering for product and process development, and investigation into multiple 'What If' scenarios. Layout - Investigation and development into optimal positioning of cell-equipment. Design - Incorporation of design aspects from numerous CAD packages/formats, and supply of design analysis. Control - Project change handling, documentation, and incorporation of customer standards and specifications. 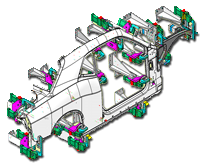 Process development - Application specific tooling design, hidden constraint verification, weld point distribution, sequencing information, and cycle-time optimisation. Off-line programming - Robot/Application specific programming integrating realistic customer specifications/standards, reducing on-line programming time and site cost whilst ensuring the developed process is implemented successfully.